Mix all the ingredients to a pancake like batter (if its too thick add water, little at a time). Scoop about 3 tablespoon of batter onto hot pan. Cook as you would cook pancake. Kimchi pancakes..... wow, looks special. And it is so simple to make for a quick spicy snack. Scrumptious! Those pancakes look fabulous. I just saw a kimchi gyoza post, and now you have kimchi pancake, I think I have to start make kimchi soon..Your pancake sound really good! Hello, blog hopping and found your's. 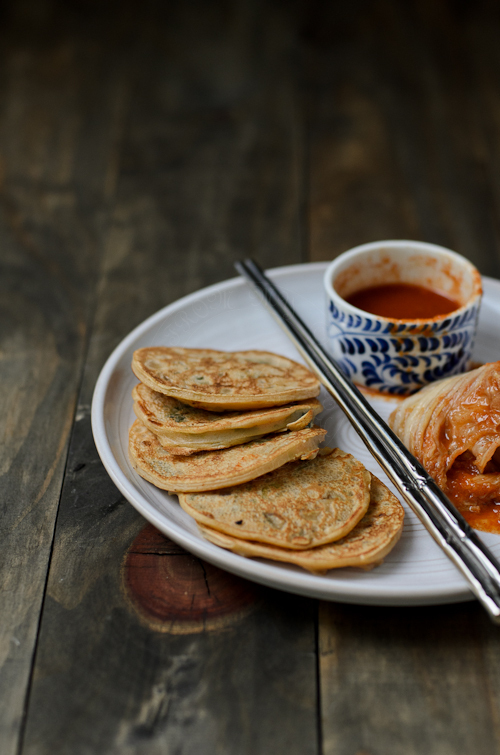 These pancakes with kimchee must be very flavourful! Have a wonderful weekend, Lisa. What a great idea! Love savory pancakes and kimchi pancakes... I've never thought of that idea! Brilliant! Hi Lisa, kimchee pancakes sounds new and special to me, great idea!!!! I love your lemony kitchen!